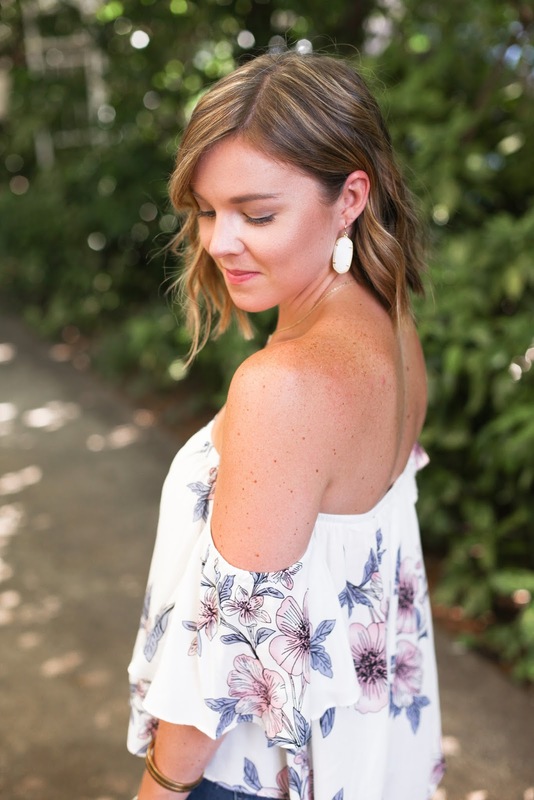 Today I wanted to share this adorable OTS top, and some tips and tricks for staying healthier in your everyday life. I am not a pro by any means, but these are just a few things I try to do on a daily basis that have helped me significantly. I would love to hear some of the tips/tricks you use in your everyday routine to stay healthy in the comments! o Eliminate all soda for water – Invest in a good water bottle. You will be more likely to drink more water throughout the day. If you’re not a fan of plain water, try fruit-infused water. Soda is just plain bad for you and contains massive amounts of sugar. o 80/20 rule – This basically means try your best to eat healthy 80% of the time, but also give yourself room to splurge. Don’t deprive yourself and eat the things you love without making yourself feel bad about it. This helps make the whole healthy living thing feel doable, and is something you will be able to do for the long run. o Add more fruits and veggies to your diet – Make sure you are eating these daily (I struggle with this one). Try to replace unhealthy snacks for fruits or veggies, and you can even replace pasta and other things with them (like zucchini noodles). o Cooking at home versus eating out – By cooking at home you know exactly what is going in your food, which helps you avoid all the added calories you can get from restaurants. Plus, it makes for a happier wallet. o Meal prep – This is key. Fail to plan, plan to fail. I usually do my meal prepping on Sundays so that I am set for the entire week! o Set a goal to get at least 10,000 steps in a day – I track this with my Fitbit, but there are many other fitness and step tracking options. o Take the stairs in of elevator or escalator. o Try getting your heart rate up for at least 20-30 minutes a day. o Get a good night’s sleep. I know that this is hard for a lot of people, but sleep is a key part to a healthy lifestyle. It can benefit your heart, weight, mind, and much more. o Surround yourself with motivation – Get one of your girlfriends to be your workout buddy. Having someone there to motivate you and hold you accountable will help you stick to your goals. I personally have joined Burn Bootcamp in Charlotte with my sister, and it’s amazing! They really push you to motivate each other, and the class that I go to is all women, so we are all striving for the same goal. o Invest in cute (affordable) workout clothes – Dressing stylish during your workout will make you more confident and energetic. Old navy is my go-to when it comes to shopping for affordable athletic clothes. They are SUPER cute and don’t break the bank. Now on to the fashion! 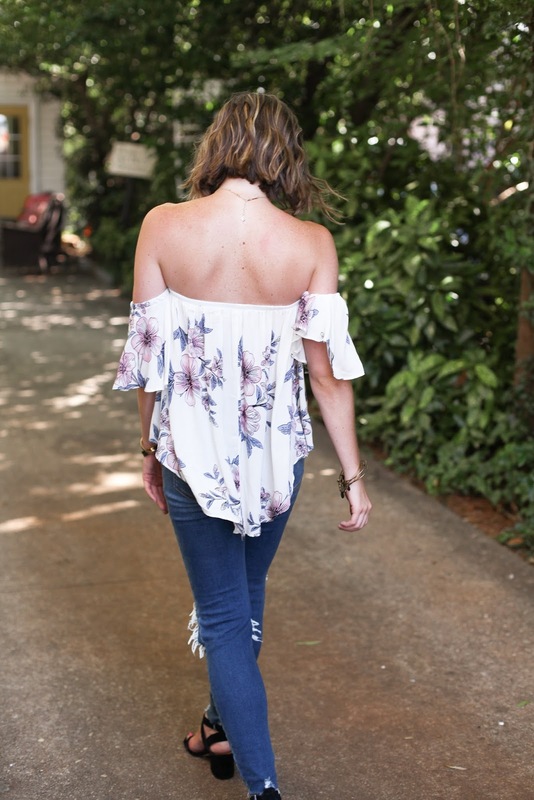 If you haven’t noticed by now, my favorite trend of the summer has been off the shoulder tops! They are just so cute and make me feel dressed up even with a just a pair of jeans. This one is from Vestique, and is by far one of my favorites! You know how some off the shoulder shirts pop up on to your shoulders when you lift your arms?!? Well this one doesn’t because the sleeves are attached differently, so its WAY more comfortable and so easy to wear. Even better, it was only $20 and I snagged it during their warehouse sale. 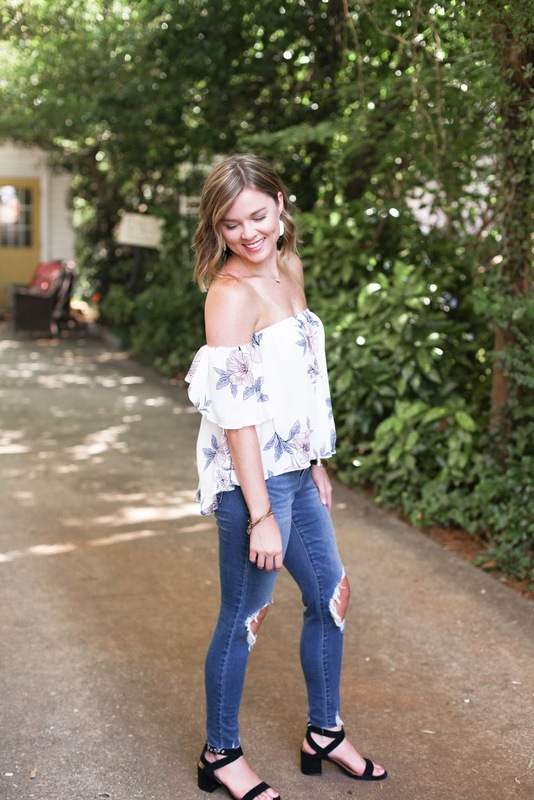 And speaking of comfortable…these jeans are from Old Navy’s new jean line, the Rockstar 24/7 (linked below). They are SUPER soft like leggings soft and I could wear them all the time. They give the appearance of jeans, and even have pockets, but they literally feel like you are wearing leggings! Hope y'all have a fun weekend!